Sunday was the biggest film festival in the world. Which was held for the 84th time in Hollywood. Here is my list of the best dressed actresses of the evening. 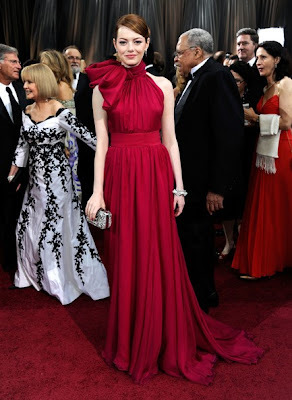 Emma Stone looked beautiful in this fuchsia Giambattista Valli couture spring 2012 gown with a high neck with a bow. She completed her look with a Louis Vuitton clutch and jewels. I had a deja vu of the Balenciaga dress that Nicole Kidman wore at the Oscars in 2007. Despite the similarities I still love this dress on Emma. I was very curious to see Rooney Mara on the red carpet. She blown me away a few times before with her red carpet appearences and this was no exception. The 'Best Actress' nominee wore white Givenchy couture gown of the spring 2009 collection by Riccardo Tisci. She has bright red lips and accessoirized her look with Fred Leighton jewels. Natalie Portman stood out by wearing a vintage Christian Dior gown from the fifties. It was no surprise that she would wear a Dior dress as she is the face of the Miss Dior Cherie perfume ad. Beautiful accessoires like purple silk shoes, a black clutch and diamond jewels finish the retro look. I was dying to see a Alexander McQueen dress on the red carpet. Jessica Chastain, nominee for her supporting role in The Help, pleased me by wearing this strapless silk organza gown with gold embroideries. This costume-made gown is designed by Sarah Burton who was inspired by nature. Gwyneth Paltrow looked divine by wearing this white Tom Ford gown with cape from his fall 2012 collection with silver jewels. She kept the look naturel with almost no makeup and a ponytail. Ellie Kemper matched her copper hair with this outstanding bronze Armani Privé gown of the fall 2010 collection. She finished her look with gold jewellery and a gold Salvatore Ferragamo clutch. Michelle Williams looked amazing in an orange Louis Vuitton dress with a peplum skirt. This retro dress is perfect for Michelle as she was nominated for her role as the iconic Marilyn Monroe in 'My Week With Marilyn'. She completed her look with pink lips and a pink clutch. Sandra Bullock wore a beautiful black and white silk gown by Marchesa with a gold embroidered waist and shoulders. The look is fished with a snakeskin clutch and a ponytail. Kate Mara (the sister of) attended the Oscars in a pink Jack Guisso couture gown with floral appliqués, a draped sleeve and a thin pink bow belt. Wavy locks with a silver pin compliment beautiful with this smashing dress. The beautiful Milla Jovivich looked stunning by wearing this white embellished one shoulder gown of Elie Saab. Red lips and retro waves completed her look.